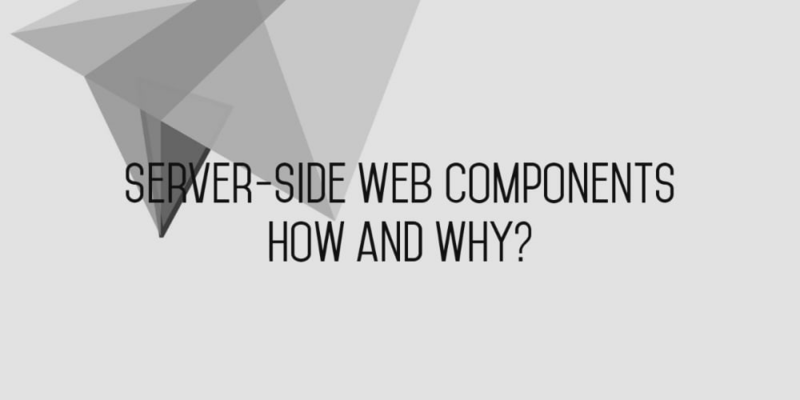 No, I’m not just talking about server-side rendered web components. I’m talking about web components that you can use to build servers. As you can see, all of the routers are split into their own components, and are easily included into the main app. The index.html file is the beginning of an easy-to-follow series of imports that lead you through the flow of routes. Scram.js is a small project that helps run Electron in a headless state, making it possible to run your server-side web components just like you would run any other Node.js application. I already have some basic apps working in a production environment using Dokku. If you’re curious, check out the Dokku Example. I just popped the library in and was able to use it server-side without modification! Electron with Scram.js offers access to LocalStorage, Web SQL, and IndexedDB, which makes localForage possible. Simple server-side databases! I&apos;m not sure how the performance will scale, but at least it’s a possibility. Also, now you should be able to use components like iron-ajax and my redux-store-element server-side, just like you would client-side. I’m hoping this will allow reuse of paradigms that work well on the client, and close the gap between the context-shifting that inevitably occurs when going from the client to the server. This benefit just comes with web components. One of the major hopes of web components is that we will be able to share them easily, use them across browsers, and stop reimplementing the same solutions over and over again, just because frameworks and libraries change. This sharing is possible because web components are based on current or proposed standards that all major browser vendors are working to implement. That means web components don’t rely on any one framework or library, but will work universally on the platform of the web. I&apos;m hoping many people will create server-side web components that package functionality just like front-end components. I’ve started with Express components, but imagine components for Koa, Hapi.js, Socket.io, MongoDB, etc. Server-side web components could help level the playing field of back-end programming. There are a lot of people, web designers, UX people, and others who might not know "programming" but do understand HTML and CSS. Server-side code as it is today probably seems untouchable to some of them. But if it&apos;s written partly in the familiar language of HTML, and especially the semantic language of custom elements, they might be able to work with server-side code more easily. At the least we can lower the learning curve. The structure of client-side and server-side apps can now mirror each other more closely. Each app can start with an index.html file, and then use components from there. This is just one more way to unify things. In the past I’ve found it somewhat difficult to find where things start in server-side apps, but index.html seems to have become the standard starting place for front-end apps, so why not for the back-end? Both structures potentially work equally well, and now we&apos;ve reduced the amount of context switching necessary to go from the client to the server and vice-versa. The biggest thing that could bring this crashing down is the performance and stability of Electron in a production server environment. That being said, I don’t foresee performance being much of a problem, because Electron just spins up a renderer process to run the Node.js code, and I assume that process will run Node.js code more or less just like a vanilla Node.js process would. The bigger question is if the Chromium runtime is stable enough to run without stopping for months at a time (memory leaks). Surprisingly, Electron/Scram.js outperformed Node.js...we should probably take these results with a grain of salt, but I will conclude from these results that using Electron as a server is not drastically worse than using Node.js as a server, at least as far as short spurts of raw request performance are concerned. These results add validity to my statement earlier when I said that "I don’t foresee performance being much of a problem". Web components are awesome. They are bringing a standard declarative component model to the web platform. It’s easy to see the benefits on the client, and there are so many benefits to be gained on the server. The gap between the client and server is narrowing, and I believe that server-side web components are a huge step in the right direction. So, go build something with them!